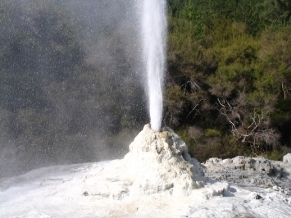 Most "how to get rich quick" schemes are like geysers - filled with nothing but a lot of hot water and mouthful of steam. So...you've got this hot new business idea and now you're wondering how to get rich quick with it. Well...here's a reality that you will have to face: the focus on "how to get rich quick" might skew your view on what it REALLY takes to make your new business succeed. Think about it like this: If it was such an original, fantastic idea, don't you think one of the other 6.5 billion people inhabiting the planet would have already thought of it and developed it? This is not to say that original ideas can't be devised by the average "Joe" (or "Joan"?) but, even if you have an original idea, what are you going to do with it? For the sake of argument, let's say that you do have a brilliant hot new can't-fail business idea. Do you have the knowledge, tools and drive to make something happen? To see it to its highest potential no matter what gets in the way? Again, giving you the benefit of the doubt, we'll assume you do. Does your "how to get rich quick" scenario then point you in the direction of easy street? If it does...then fire it, because it's leading you astray. The "how to get rich quick" fantasy often robs you from the reality that a successful business - any successful business - requires hard work. Your hot new business idea has to have time to be developed and nourished with loads of sweat, tears and MONEY. Even simple ideas need plenty of money (i.e., working capital) to truly launch. So you say you have access to plenty of working capital? But...how are you going to turn this brilliant idea of yours QUICKLY into loads of money? Let's look at "how to get rich quick" for how it REALLY is. Haven't we all either seen or heard of infomercials or ads claiming to help you foster your ideas into big money? It's usually a pitch to listen to a set of audio tapes or buy into a certain "proven" system developed by some young, attractive entrepreneur who was once in your shoes and is now sipping on foo-foo drinks on the beaches of Bali. Do you really believe that by paying this blowhard $500, you are going to be the next massive star? Think about it. By buying into this scheme you are helping fulfill some OTHER person's "get rich quick" dream! And, to be sure, it was not all that quick. It took a lot of time, money and moxie to launch the idea and get it on television (or in print media). Yes there ARE ways to develop your small business ideas into viable money-making ventures. But, even if all the stars are perfectly aligned, it is NOT something that is going to happen QUICK. This is really a well laid-out, thoughtful, pragmatic, yet entertaining piece of wordsmithing. You are on your way...Well done! !